Transitioning from Beach Builders, Inc. to Beach Hensley Homes, our business rolled out a newly changed aesthetic in August. Many people have inquired about this transformation. Why the name, aesthetic, and website changes? What motivated our decision to shift the image of our business? We entered into the brand change to reflect a shift in our company vision. We had set out to make a difference as a homebuilding company in Asheville. As our understanding of the Asheville building scene deepened, we identified a need in the market–a place to make a real difference. Many homeowners would like to build mindfully, but don’t believe it is possible within their budget. We wanted to create affordable options for homeowners who want to build a green-certified, energy-efficient home. To better meet this growing need, we developed three fixed-price plans. The upfront price points eliminate uncertainty and hidden costs for these projects, enabling individuals and families to build mindfully within the confines of a limited budget. We wanted our brand to reflect this directional shift, moving towards an image that would emphasize our mindful building process. We sought a marketing partner that would listen to our story and design an aesthetic that would emulate where we wanted to go with our business. We wanted our brand to align with our values and work. 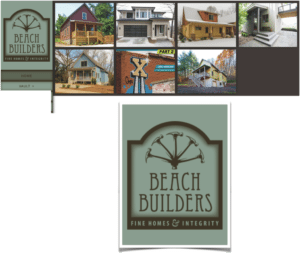 The original Beach Builders, Inc design was in a classical, traditional style with a muted color palette. Its sign harkened back to the old-fashioned style of craftsmen’s over door symbols. When our business’ vision shifted, this aesthetic was no longer a strong visual representation. The new, modern Beach Hensley Homes aesthetic was designed with the buildings’ architecture as well as the company’s vision in mind. The slanted line that recurs throughout the brand materials was drawn directly from the architecture of the homes that the company has created. Colors from the natural world were captured in the brand palette, crafting a feel that is both fresh and environmentally mindful. 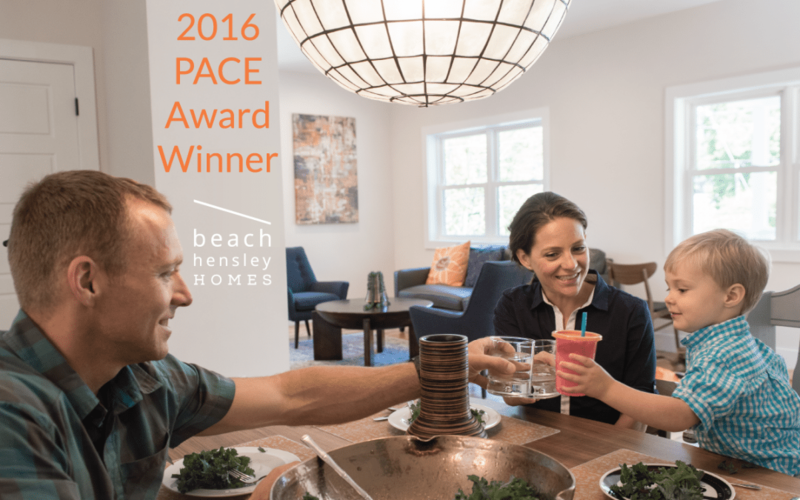 We have received a lot of positive feedback from the community in the short time since we launched the new look of Beach Hensley Homes. Just last week, we were awarded a PACE Award from the Asheville Home Builders’ Association for “Best Website.” However, the most rewarding aspect of our new appearance is that our new brand feels like a good fit. In every piece of our brand materials, we are confident that our work is being accurately represented as community members and potential clients develop a deeper understanding of who we are and the services that we eagerly, skillfully provide. This new brand highlights what sets us apart, what we do better than anyone else, providing the perfect home building experience.